For our first post of 2016, it's right back into the thick of it. Last year we asked you to submit your Top 10 questions for the DfE about your experiences of the new SEND system. You certainly did, thank you, and they were so diverse that it was quite difficult to separate them into a 'Top 10'. 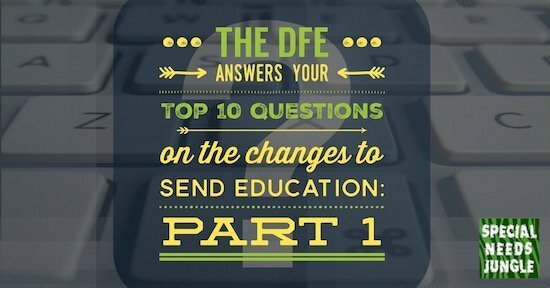 In the end, after working through them, I sent in 10 'themes' with your questions categorised under the themes, so that the DfE could get a good look at the range of concerns you have. I'd hoped to have the reply before Christmas and indeed, they were sent, but I wasn't counting on my spam filter to eat it! Happily, though, I have received the answers to your questions now and I have promised to paste them in verbatim. However, the answers (and the questions) are lengthy, so I've split them into two parts. The first part is today, the second part is on Wednesday, so if you aren't already signed up, please consider this so you don't miss Part 2. Thank you to Stuart Miller, Deputy Director of SEND at the Department for Education and his team for the time spent on this and I hope you feel that your questions have received a good response. Please add your comments to the blog post in the comments section here as this is the only place they will be seen by all. Thanks so much for collating questions from your readers and for sending them on to us. We get lots of feedback on progress with the SEND reforms and on wider SEND issues, from a wide variety of sources, but there’s nothing like getting this sort of feedback, directly from parents. You asked a lot of questions (!) so it’s taken us a little time to fully absorb and answer everything – and we were grateful to you for the work you did to make our lives easier by compiling them into ten groups. Question: There is still confusion about how to access specialist support in mainstream for conditions such as dyslexia; and confusion about how the new single category of support can help parents to understand how well their children are meeting their personal targets and succeeding at minimising the effects of their learning difficulties. How can you help them with this? As a starting point, we need to emphasise that all schools must use their best endeavours to make sure those children with SEN and disabilities get the support they need. Schools are expected to have clear systems for identifying, assessing, monitoring and securing appropriate support for children with SEND, and are also required to involve parents in a more structured and systematic way. The new Code of Practice places greater SEN responsibilities on teachers, as we know that what goes on every day in the classroom makes the most difference to children in school. The response to Question 3, below, goes into a bit more detail on training and support for teachers. The new SEN support system takes the form of a four-part cycle known as the graduated approach. For children with a specific learning difficulty or dyslexia, there should be a cycle of assessment, planning, doing and reviewing. Clear programmes with measurable outcomes need to be in place, with appropriate interventions specific to the child’s needs. Reviews with parents should occur at least three times a year. Special Educational Needs Coordinators (SENCOs), who are qualified teachers with a specialist SENCO qualification, should be helping teachers where necessary. A range of wider measures are in place to increase knowledge and skills about dyslexia in the school system. For example, we have provided funding to a number of dyslexia charities to train teachers and those working with dyslexic children; to develop teaching and support materials; and to look at early identification. There are changes at the moment to the National Curriculum assessment system, and we are seeking to ensure that those performing below expected levels are fully included as part of any new assessment approach. The Rochford Review into this has recently issued its initial report. Question: Children are still being excluded from activities in mainstream schools because of their disabilities - sometimes because schools don't have the funds to provide support staff. What can you say about this? The SEND Code of Practice, to which all schools must have regard, emphasises the central position of the Equality Act 2010 in providing protection from discrimination for disabled people. Schools are expected to make reasonable adjustments so that children and young people with disabilities are able to join in with school activities and trips. Where parents experience otherwise – for example, that their child is excluded from such activities – they should raise it firstly with the school’s governing body. If this does not improve the situation, they can make a complaint to the local authority if the school is maintained; or to the Secretary of State if the school is an Academy. Where a parent feels that discrimination has occurred, s/he can make an appeal to the SEND Tribunal. Regarding inclusion more widely, the Children and Families Act 2014 has maintained the general presumption in law of mainstream education when it comes to decisions about where children and young people with SEN should be educated. There are good examples of provision in mainstream schools that can meet very complex needs, but for some schools there remains a journey to travel. Local authorities, schools and families need to continue working together to widen the local offer of such provision. Finally, in relation to children and young people with life-limiting illnesses, our guidance, which all schools must follow, emphasises that governing bodies should take into account that many of the medical conditions that require support at school will affect quality of life and may be life-threatening. We expect governing bodies to ensure that the focus is on the needs of each individual child and how their medical condition impacts on their school life, and to make decisions in the light of each individual set of circumstances. Question: Parents and their children with SEND are still being poorly served because of the training deficit inside LA SEND departments and in schools about the new system, both the legal and the cultural aspects. What can you do to improve this and also, as far as the Carter report is concerned, ensure that the recommendations about SEN training for teachers are carried out? Training and preparing the workforce for the reforms has been an essential part of the strategy for implementing the changes. Much has been done but the workforce involved with children and young people with SEN and disability is large, and the changes themselves are wide-ranging. This will continue to be an area of focus for us, so that all the key workers become fully skilled in the new approaches. Specifically, for local authority SEND departments, since 2013, there has been a wide range of training provided, some by the local authority SEND pathfinders; and some by our partner organisations. Regional networks have continued to provide training since September 2014. Workshops on key areas of the reforms, such as transitions, local offers, joint commissioning, and EHC planning and assessment have been delivered, to provide training and development opportunities to local authority staff. As part of their initial training, all qualified teachers in England should be able to identify and respond to children’s individual needs. Following the Carter review of initial teacher training courses, work is going on to see what changes may need to be made so that statutory frameworks such as the Equality Act are reflected in the new framework. The National College for Teaching and Leadership has produced a series of online training materials for teachers with a focus on the most prevalent forms of SEN, including dyslexia. Question: It is clear from the questions sent in that there is a widespread lack of knowledge among parents and practitioners alike about the changes. Even when parents do know about the changes, they seem to have trouble getting schools and the LA to comply. Could you please reflect on some of the points below and offer an answer that incorporates some of the queries and points? We will be running EHCP workshops between January and March next year. These will be targeted at LAs and parent representatives, and are intended to help local areas produce effective EHCPs that properly engage families; and write EHCPs that are legally compliant and draw from best practice. The SEND Code of Practice describes principles underpinning support that local authorities must give parents in order to access information and assessment services. The local offer needs to be accessible to those with a range of needs. Where a parent feels their circumstances require individual arrangements, they should raise this with the local authority or the IASS, or an Independent Supporter. Similarly, where social care provision is identified in Sections H1 or H2 of an EHC plan, the local authority is legally responsible for providing the identified provision. Where this is not happening, the parent or young person has the right to make a formal complaint under the ‘Local Authority Complaints Procedure’. Finally, all local areas (including local authorities and health services) will be the subject of inspection by Ofsted and CQC from May 2016. These inspections will focus on how well needs are identified; how well they are met; and how well the local partners work together. Question: There appear to be significant problems persisting with transfers from statements to the new system. Many have similar themes. Could you please take a look below and touch on some of the points in your answer as to why this is still the case? We want all children and young people to benefit from the new system as soon as possible. There are around 250,000 children and young people with statements or Learning Difficulty Assessments (LDAs), so transferring them to the new system is a significant undertaking for local authorities. Most have employed additional staff to help with the task, but it has taken time to recruit and train this new workforce. In the first year, some local authorities set quite high targets for transferring particular groups, beyond what was statutorily required, as they wanted to ensure that families could benefit from the new system quickly. However, this proved over-ambitious and several reduced the numbers during the year and concentrated on the groups that must be completed. Completing the transfer of individual statements within the required timescales has been challenging, and, from September, we therefore extended it from 16 to 20 weeks; matching the timescale for new assessments. This was partly because it was what parents were telling us they wanted. We are also advising local authorities to make sure that, where a delay is predicted, they communicate this to the family so that everyone knows what is happening and when the likely completion date will be. In August 2015, we issued amended guidance on the transition process and followed this up, in September, with workshop training for local authorities and parents. We helped local authorities to share good practice and most have subsequently amended their transfer plan to ensure they can complete the transfer of LDAs by September 2016; and statements by April 2018. Where families, the local authority and the educational psychologist (EP) agree that the existing psychological advice is not sufficient for the EHC needs assessment, the EP must provide new advice and information. In addition, as a local authority employee, there may be times when an EP is asked to lead a transition review meeting. We are continuing to monitor local authority performance in this area closely, and providing challenge and support as necessary. You can read Part 2 of the answers here about provision, post 16, alternative provision, appeals and personal budgets! Sign up to new post alerts via email so you don't miss it and leave your comments on the first five answers below. Thank you for all your efforts Tania and co. It’s a pity there’s nothing much new from the DfE. Mostly the seem to have parroted the code and other guidance. Im not sure that the concerns that are arising have really been taken on board. Training for LA staff and relevant school staff should be made compulsory for a start and the BTEC in SEN casework should be urgently revamped and relaunched. There needs to be much clearer guidance on how personal budgets are arranged. Hi, yes, I wasn’t expecting them to announce anything new in these answers, rather to clarify the existing legislation that may have been twisted or ignored by LAs. However, by answering questions like this it may be that the common problems that parents are facing will highlight to them where the CoP or regulations needs to be tightened or strengthened. In this way, it is a very valuable exercise. I plan to take the points made and turn them into a fact sheet for downloading for parents and anyone else. Thanks for this Tania and co. I concur with the comments from the readers that the DFE have quoted the CoP. B The Law associated with meeting them. You also need to know that all needs, diagnosis, and their associated SEN need to be listed within section F of a plan as only then will provision to meet these needs be made. Also be aware that even if you reach the Golden Egg of Provision you have to watch like a Hawk and chase implementation. If provision is not made, you have the right to ask why, answers must be given, it is your right as the parent/carer or 16+ youngster. Best of luck from a fellow war torn veteran of the system! Thanks for your comment – yes you’re right, it is still a battle but hopefully the more information we get out, the more help parents can get to access the right help. Questions about Personal Budgets are included in Wednesday’s answers, so don’t miss them! Thank you Tania. Special Needs Jungle and I.P.S.E.A. have proven to be invaluable support throughout the process of accessing provision. I have shared via FB highlighting this article as it strips down to the nitty gritty. The SEN Guidelines are not a read for the feint hearted! !